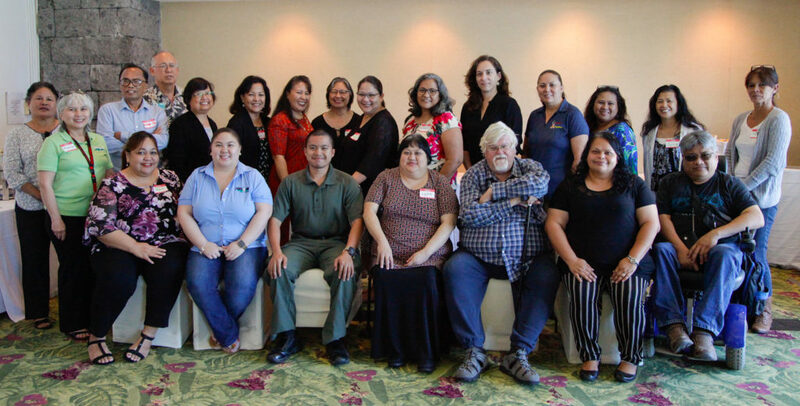 April 11, 2019: Guam CEDDERS facilitated a stakeholder input session with self-advocates and family advocates/personal care assistants to provide input on the progress of services and supports as outlined in the Tri-Agencies Five-Year-Work Plan at the Pacific Star Resort and Spa. 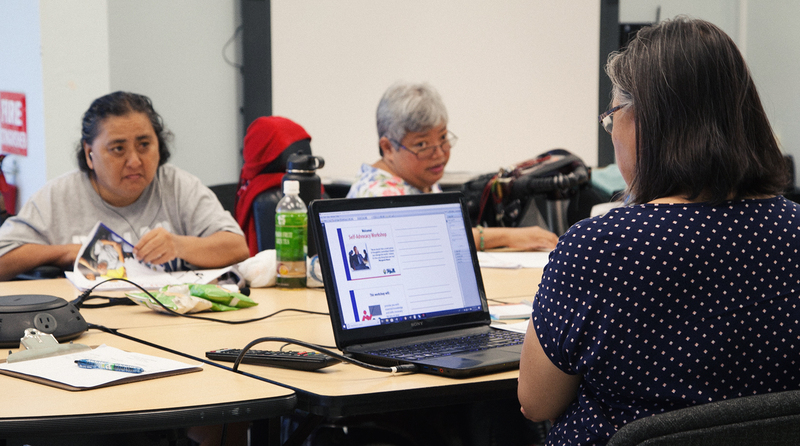 Mary Kidd, Guam CEDDERS Consultant (sitting center), utilized the World Cafe process to enable participants to focus on specific topics and share feedback on assistive technology, public awareness, and self-advocacy. 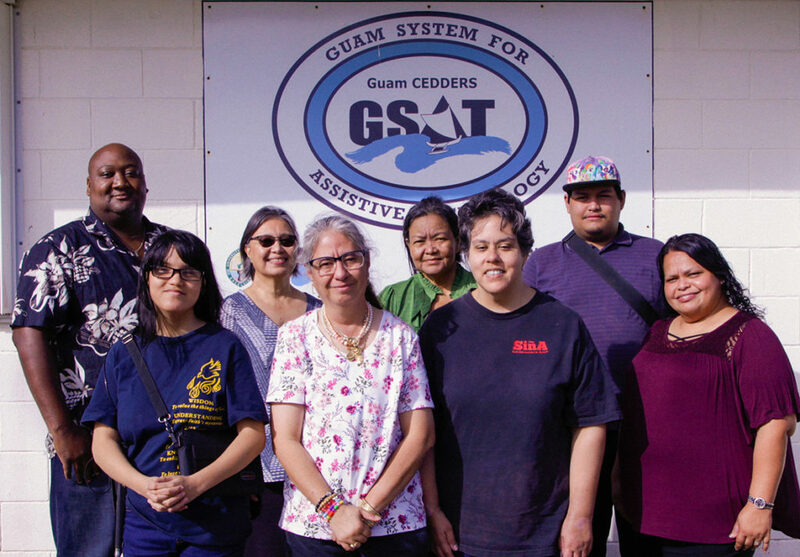 February 16, 2019: Five Self-Advocates gather with Guam CEDDERS staff following completion of a 2-day Self-Advocacy Train the Trainer Workshop, February 9 and 16, 2019 at GSAT. Front row (L-R): Self-Advocates Maria Bontogon, Barbara Johnson, and Candice Perry. 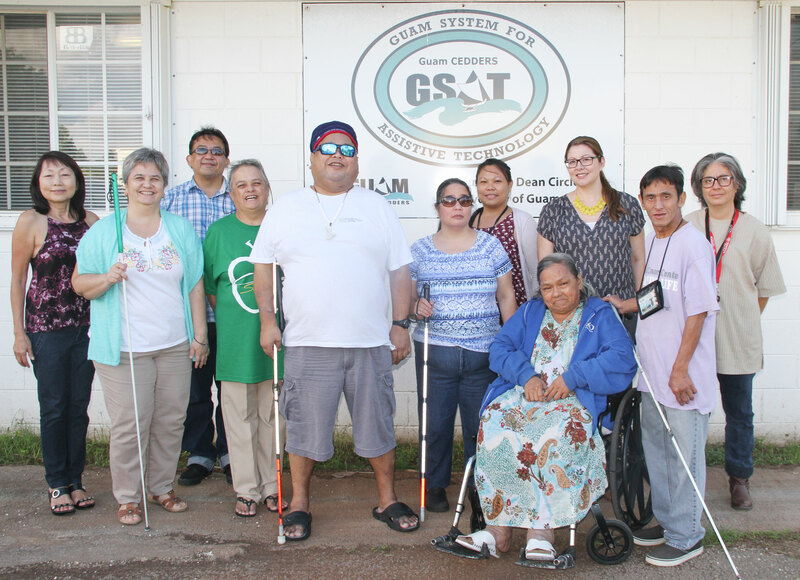 Back row (L-R): Kunta Edmond, UOG Social Work Intern; Mary Kidd, CEDDERS Consultant, Esther Gina Arca and Silvestre San Nicolas, Self-Advocates; and Tanya Simer, Guam CEDDERS staff. February 16, 2019: Self-Advocates review an activity in one of five modules of the Self-Advocacy Training Program for Individuals with Disabilities at a Train the Trainer Workshop held at GSAT. Seated clockwise are: Silvestre San Nicolas, Self-Advocate; Mary Kidd, CEDDERS Consultant; Maria Bontogon, Candice Perry, and Barbara Johnson, Self-Advocates; and Kunta Edmond, UOG Social Work Intern. February 9, 2019: (Clockwise) Maria Bontogon, Barbara Johnson, Candice Perry and Silvestre San Nicolas participate in a Train-the-Trainer Self-Advocacy Workshop with E. Gina Arca (not shown) at GSAT. Facilitating is Mary Kidd with Evangelis Babauta, ASL interpreter. 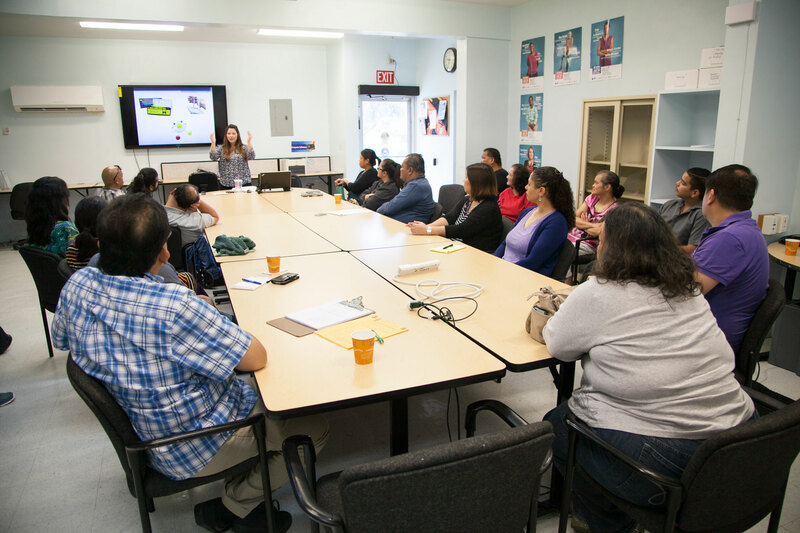 November 17, 2018: Susan Dugan, GPPT/Project Fitme Coordinator, facilitated a Parent Leadership Training on Self-Advocacy for parents and family members at the Hagatna Library. 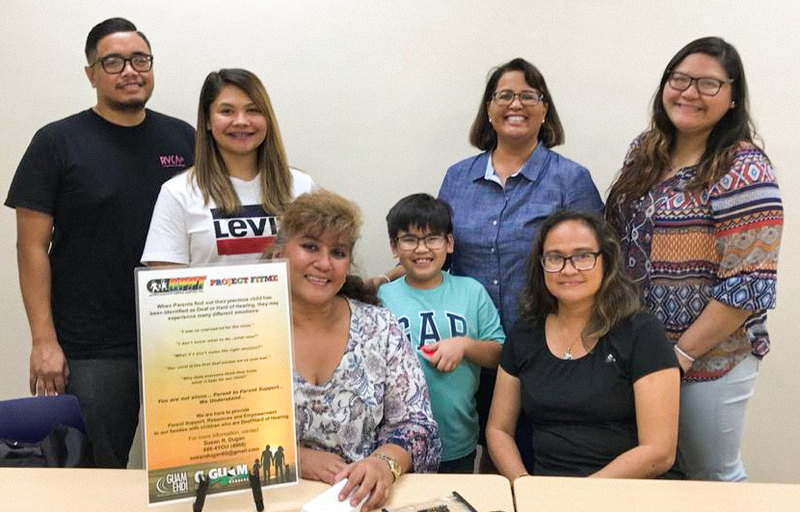 The training focused on the Individuals with Disabilities Education Act (IDEA), Individualized Education Plan (IEP), Guam Legal Services Corporation-Disability Law Center (GLSC-DLC) and other resources parents can access to ensure their child receives Free and Appropriate Public Education (FAPE). Additional information on how Parent Mentors can offer additional support as parents navigate resources for their children’s needs. (Pictured from left to right) John Mabayag, Jay-Lynn Mendiola, Trisha Suzuki, Caleb Suzuki, Susan R. Dugan, Program Coordinator; Evelyn Topasna, and Ashley Babauta. Guam CEDDERS showed the latest draft of “Ta Fan Acomprendi: Communicating with People with Disabilities to SiñA members on August 13 during their Self-Advocacy Refresher Workshop. Feedback received was very positive. Next steps include finalizing edits and adding audio description. 2016 marks the 10 year anniversary of I Linå’lå-ta “Our Life’ newsletter. 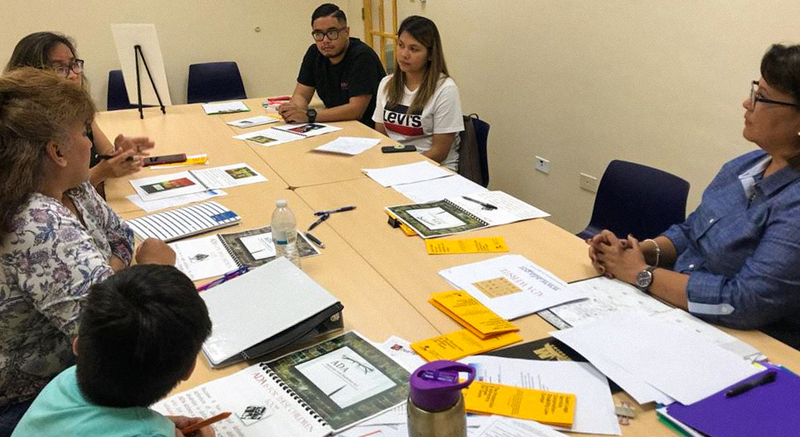 To commemorate this milestone, Guam CEDDERS met with Lynn and Andrew Tydingco to discuss the process of passing the torch of producing the newsletter to Self-Advocates in Action (SiñA) for years to come. 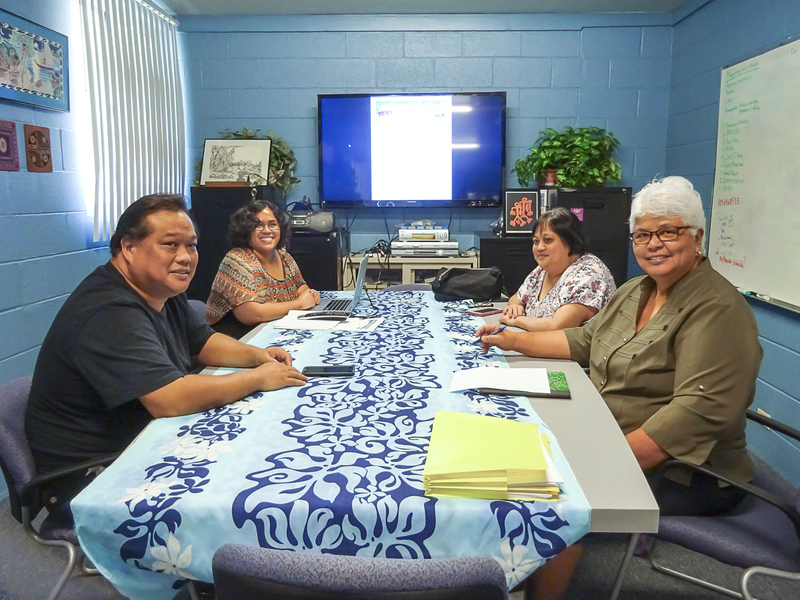 Attending this initial meeting were (L-R, clockwise) Andrew Tydingco, SiñA Representative, Sherry Guerrero, Guam CEDDERS, Lynn Tydingco, SiñA Representative, and Terrie Fejarang, Guam CEDDERS. 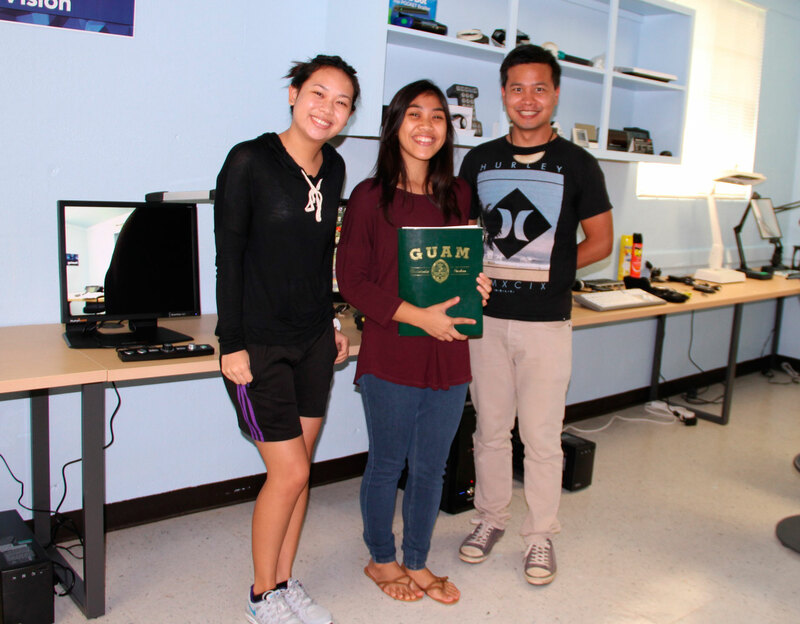 A Scavenger Hunt assignment was given to the seven students enrolled in UOG’s ED443, Assistive Technology class. Their assignment was given to them to familiarize themselves with GSAT, its vast array of technology, and an opportunity for “hands-on” exploration of its lending library. The students were given multiple scenarios/circumstances in which they needed to identify a minimum of two assistive technology devices, ranging from low to high tech that would assist in providing sufficient support in those areas. In the photo above, Ann Flores, Anntonette Quiambao, and Gabriel Posadas, (L-R) came in to GSAT on November 13, 2015, to complete their scavenger hunt. 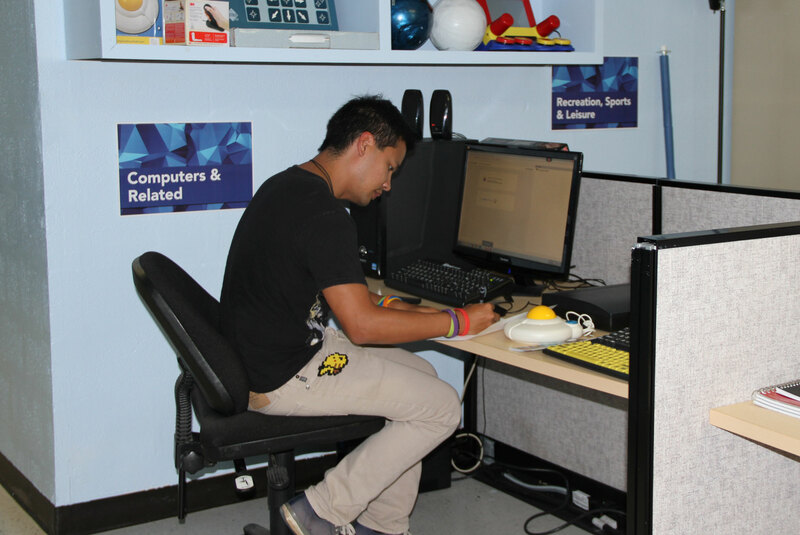 Gabriel Posadas, a student from the University of Guam’s UOG’s ED443- Assistive Technology class, explores features of a software program designed to help students with learning disabilities who struggle with reading and writing. The GSAT Advisory Council held its general membership meeting on October 27, 2015. During this meeting, new officers were elected. The new officers and members of the council can be seen in the photo above. 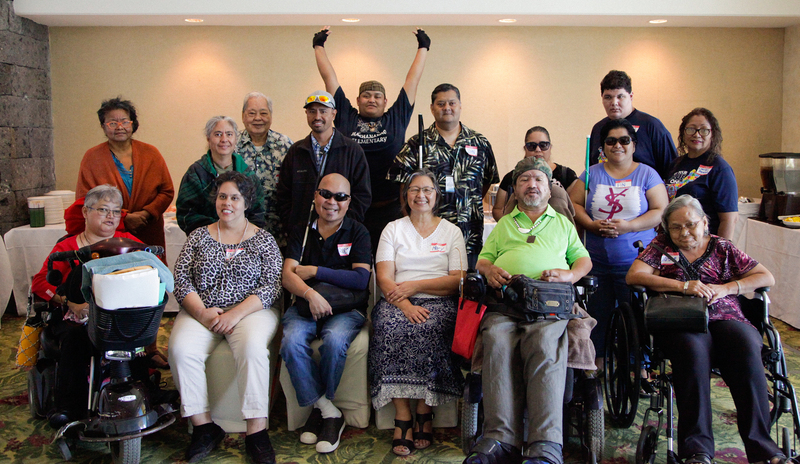 They are (Left to Right): Lou Mesa, Member at Large; Lee Perez, community member; Raymond Sayas, Guam Development Disabilities Council representative; Dawn Maka, Secretary; Roy Rosario, Member at Large; Lisa Ogo, Member at Large; Jennifer Vicente, Guam Legal Services Disability Law Center representative; (seated) Josephine Cortez, community member; Carla Torres, Guam System for Assistive Technology program coordinator, Barbara Johnson, Chairperson; Rudy Ignacio, Vice Chairperson. 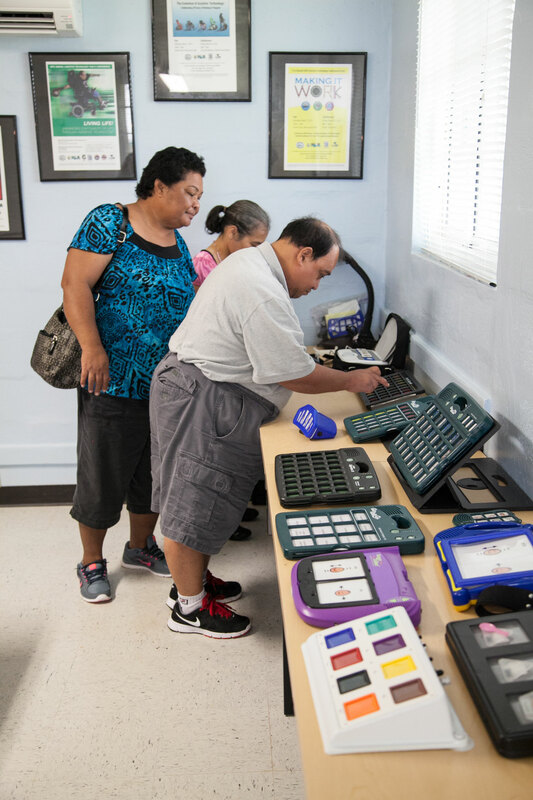 As part of the activities to commemorate “National Disability Employment Awareness Month,” Carla Torres, Guam CEDDERS Assistive Technology and Special Projects Coordinator, conducted a presentation on “Assistive Technology Utilization in the Workplace” on October 8. Attendees included individuals with disabilities, family members, and personnel from the Department of Integrated Services for Individuals with Disabilities (DISID). Community members try the various communication devices on display at GSAT’s new AT Center.